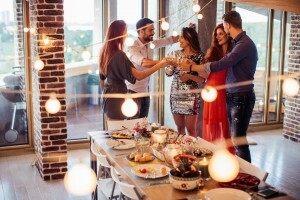 The holiday season can put quite a load of pressure on all of us, especially for those of us who are hosting our friends and families for a holiday party. But your holiday party doesn’t need to stress you out anymore.All of us have been to wonderful Thanksgiving, Christmas, and New Year’s Eve parties. And many of us have been to some not- so- wonderful parties on those holidays. What is it that makes the good parties so great? Here are 11 tips that can make your hosting duties a little easier and your holiday party one to remember. The last thing you’ll want to be doing during your holiday party is being antisocial with your guests because you’re cooking. Prepare the hard stuff before everyone gets there. Up to two days before your party, you can prepare your pie crusts, pie fillings and even your sauces. The day before your party, make the side dishes that can be easily reheated like stuffing, soups, potatoes, or casseroles. Leave the turkey or ham to the day of. In actuality, it can be one of the easiest to cook because it has to sit in the oven for a long period of time. This tip is more for you than it is for your guests. If you know what you are cooking ahead of time then you can plan for it easier. Brainstorm what you want your appetizers, entrees, sides, desserts, and drinks to be about one week before your party. When you get the menu figured out, write out the ingredients you will need as well as the instructions of how to prepare each dish. Keep the instructions on hand close by because you will need them periodically throughout your preparation process. The most important element to a successful holiday party, at least for your guests, is comfort. Don’t overly concern yourself with making things incredibly fancy. If you are planning on a lot of guests attending, then having them all sit at a table for the meal may be a little uncomfortable. Instead, why not set up a buffet style dinner to make food getting a little easier? If you have a large centerpiece at your table, remove it when dinner starts so that it’s not in the way. This is especially true during Christmas parties. Music lightens the atmosphere in the room and puts everyone in a festive mood. Be careful not to make it too loud so that your guests won’t be able to hear themselves talk. Just keep it at a nice low to medium volume so that people can socialize and enjoy themselves. No matter what, even after eating a large meal, your guests are always going to appreciate being able to munch on snacks and drinks. Set up a separate table that is designated specifically for them that’s out in the open and available to everyone at anytime. Provide a good mix of salty and sweet snacks like pretzels, fruits, cheeses, or cake bites. Make sure that your drink selection has a good balance between carbonated and uncarbonated options. While making sure that your party is well supplied with drinks and snacks, it’s one of the hardest things in the world to make sure that your ice doesn’t melt within the first few minutes. Get an insulated container and line it with aluminum foil. This will keep the area around the ice colder, helping it to not melt as fast. Remember to keep the ice covered so that the outside heat in the room doesn’t get to the ice. The most awkward time during a party is either waiting for the meal to begin, or not knowing what to do immediately afterwards. Fill that potentially awkward time with some holiday-themed games like charades, a Christmas gift wrapping contest, or karaoke. Games can also help break the ice between some of your guests that may not know each other very well or with family members you haven’t seen in a while. Whether it is for Thanksgiving, New Year’s, or Christmas, you’ll want to make sure that your party’s decorating stays with a consistent theme. Comfort. The most important thing to remember when decorating is to make sure that your guests can relax. Your decorations shouldn’t get in the way of your guests socializing. It’s best to embrace a minimalist approach to decorating. Don’t go overboard on the streamers, lights, centerpieces, or balloons. One thing that is bound to make your guests feel the most uncomfortable at your party is a host that is demanding that rules be followed. It’s perfectly reasonable to require that your guests not walk around your home with muddy shoes on, but when you start demanding dress codes and conversation regulations, no one will ever want to come to one of your parties again. The most important thing to remember is to have fun. That’s what a party is for. If you know that many of your guests will bring young children to your party, it’s probably not the best idea to pull out the most expensive china and crystal glasses. There’s nothing wrong with using paper plates and plastic cups for convenience sake. If your guests are older, don’t make getting to the food too hard for them. If you know your guests are going to want to watch football on Thanksgiving, make it available to them. Again, it’s all about comfort. his is perhaps the most important tip of all. It’s OK if you can’t do all the party planning or preparation by yourself. Enlist the help of a close family member or friend that will be attending the party to help cook the food or prepare the decorations. Remember, just because you are responsible for the party, doesn’t mean that you can’t enjoy yourself. Allow yourself to have fun and ask for help when you need it. This holiday season doesn’t need to wear out your nerves. Your party doesn’t need to be the source of that stress. If you apply these 11 tips, you’re guaranteed to have your guests talking about your party all year long.